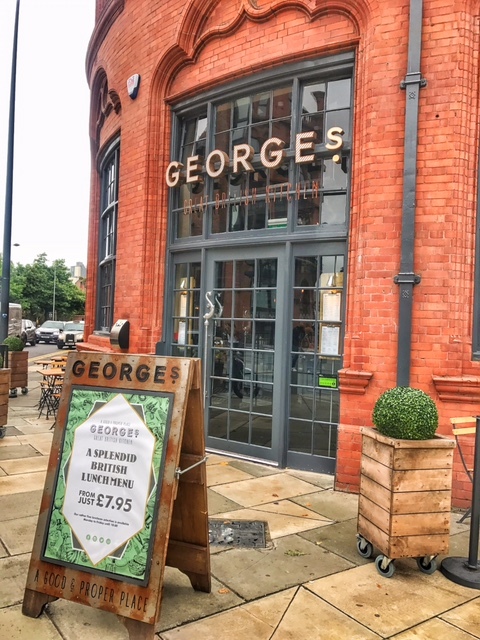 Way back at the end of October last year, Liverpool saw the opening of a new 'British' themed restaurant in the form of George's Great British Kitchen. I went down to do a review and fell in love with their original take on fish and chips and their sickeningly sweet & playful desserts. 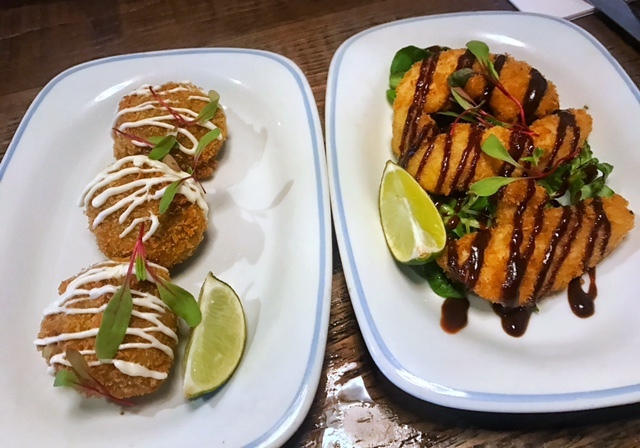 Now, almost a year on, the restaurant has a whole host of new dishes on the menu and I was kindly invited back to try a few of them on for size. Having just returned from a 10 day stint on an all-inclusive holiday we couldn't face the prospect of alcohol on this occasion, a sad state of affairs considering the cocktails are George's are creative, fun and absolutely de-licious. 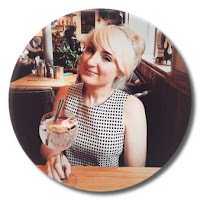 As it turns out swerving the booze this time was a blessing in disguise since the soft drinks available are so much more than your usual diet coke et al offering. 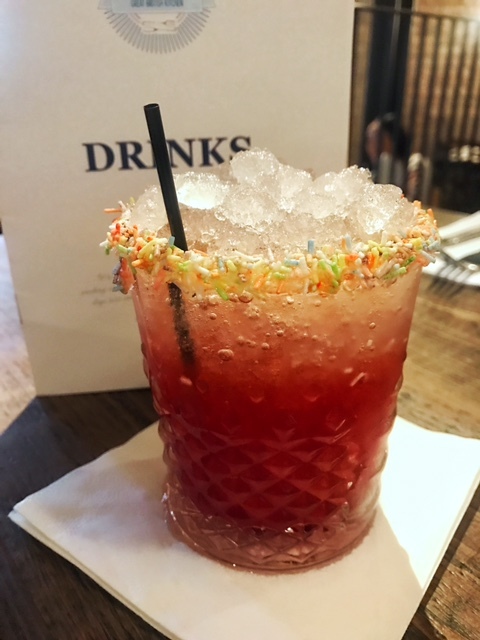 During lunch we sipped away on a classic Dandelion and Burdock, a sweet and sherbet-y Homemade Lemonade, a delicious Rhubarb and Custard concoction and a 'Fab' Mocktail. Based on the ice-cream van favourite it was super tasty and even had a rim dipped in hundreds and thousands. 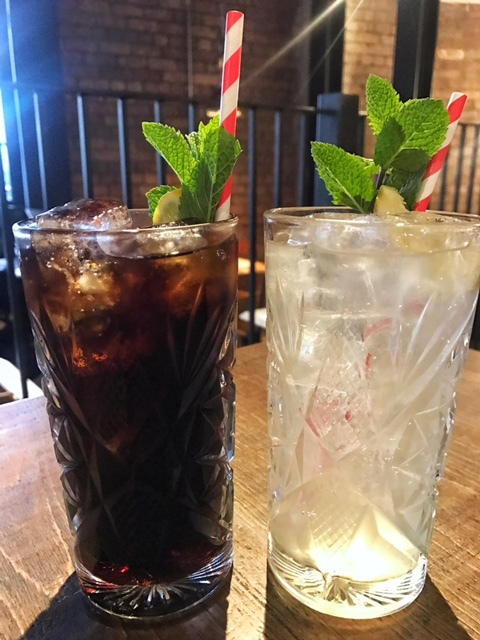 It's very rare that a restaurant's soft drinks offering matches up to it's cocktail list but George's does it with ease. 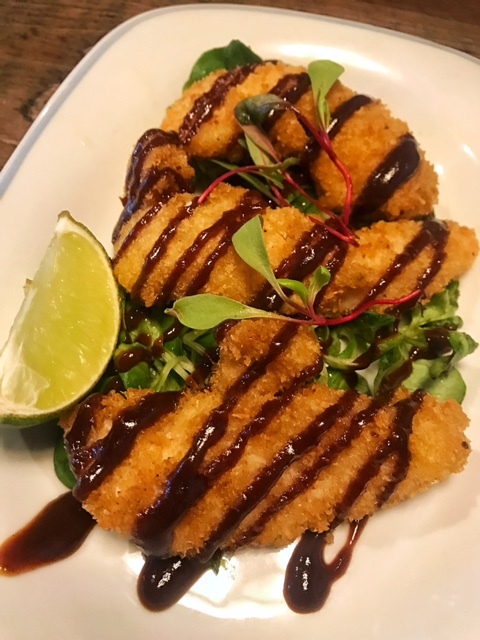 We planned on dining light on the food front, too, however George's version of a light lunch menu is everything you'd expect in a restaurant based on homely British classics. Rich, warm, comforting and very, very filling. We started with Mushy Pea Fritters (£4.85) and Chicken Goujons (£5.65). Now I don't know who it was that invented mushy pea fritters but I'd like to find them and give them a big, sloppy kiss. 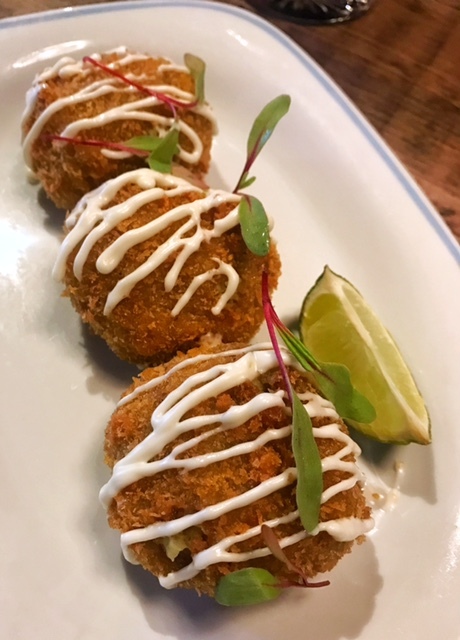 These crunchy bites filled with smooth and creamy mushy peas are the chippy item I never knew the world needed. Don't even think about going without trying them! 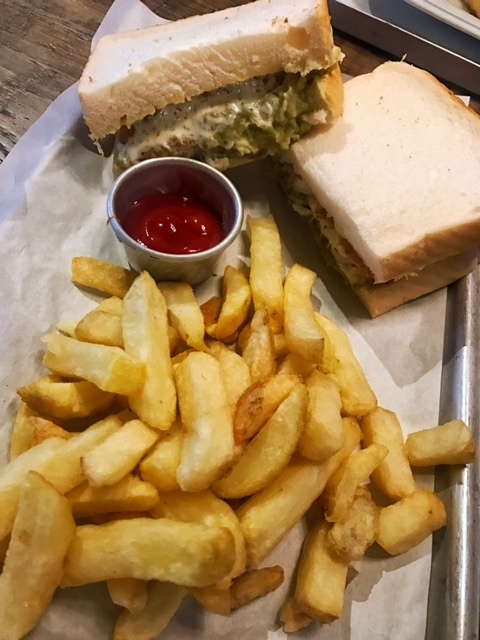 For our 'light' lunchtime mains I went for a Proper Fish Finger Sandwich (£7.95), made with fresh breaded cod, mushy peas and tartare sauce on a couple'a slabs of soft white bread. 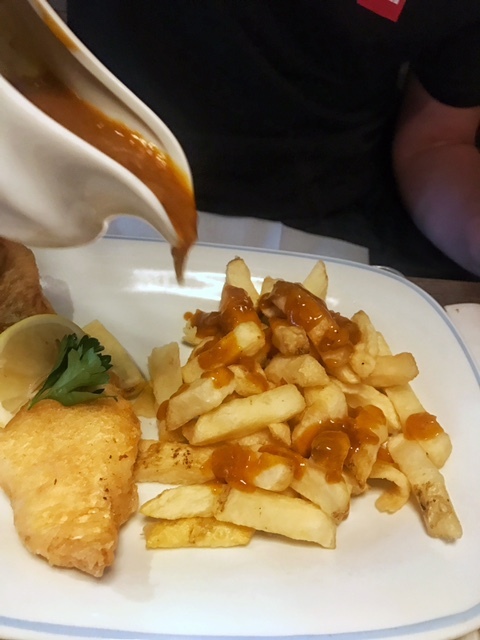 My lunch date had the 'small' Wild Ocean Cod (£8.75) which, like my sandwich, was served with proper chippy chips and a generous jug of fruity curry sauce. Also more mushy peas, it was a mushy pea fest honestly. Like I said, by this point I was absolutely stuffed. Despite opting for the lunch menu the portions at Georges are still pretty hefty. 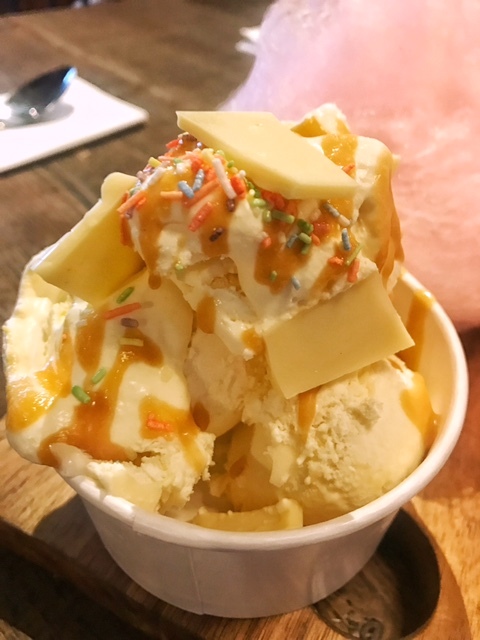 Whilst I was tempted to order the infamous Apple and Caramac Crumble Pie again for dessert, we decided to go for some ice-cream instead (ice-cream is liquid therefore less filling- do you see the logic?). 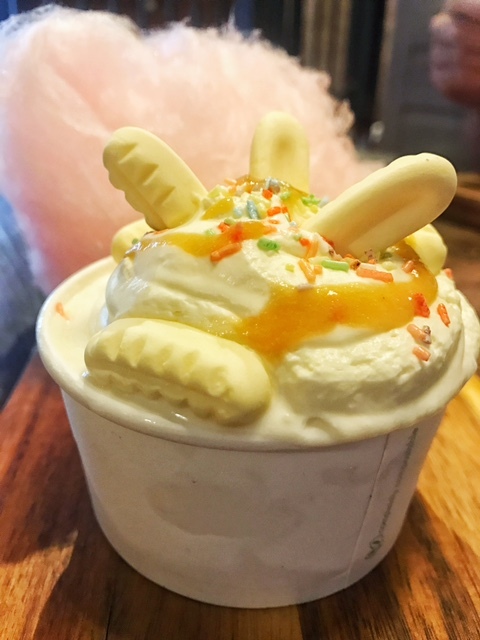 Like the rest of the menu, the ice-cream comes with a cheeky twist. Mine tasted like foamy bananas, my partner's flavoured with chunks of Milky Bar chocolate. 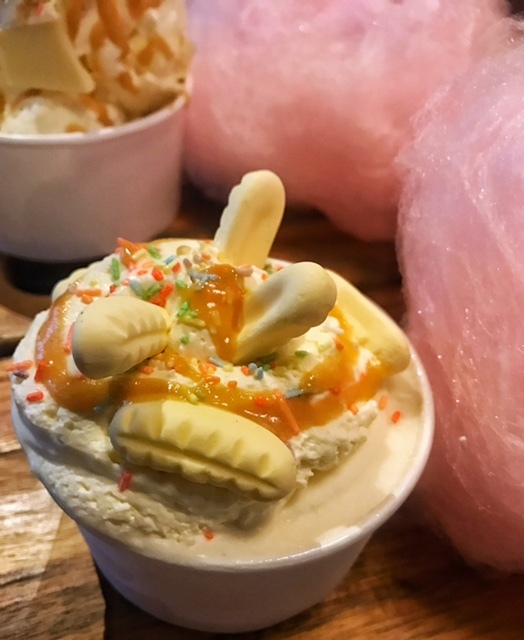 Both served with a cheeky ball of candy floss just for good measure. What self-respecting grown-up wouldn't be secretly thrilled with that? I was really looking forward to visiting George's again. Despite visiting on a quiet weekday lunch time I was pleased to see it hasn't lost any of its original charm and magic. The food is fun, the cocktails are fabulous and you can't help but have a good time. Just make sure you bring your stretchy pants.